I don't have a favorite book from 2011, though I did discover a few authors that I really like: for mysteries, Robert Crais and Charles Todd; for romance/humor, Susan Elizabeth Phillips. I finally read Middlesex (loved it), and Cutting for Stone (also loved). I re-read Jane Eyre. I'd like to say that I have a goal of beating 53 books for 2012, but I think it's a pretty decent number, and I'll be happy to match it. 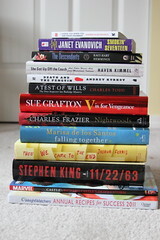 Now, of course, I've got to get to work on the stack of fabulous books I got for my birthday and Christmas this year. I really liked Middlesex too...I can't wait to read Townie.